Two small asteroids in unrelated orbits will pass within the moon's distance of the Earth on Wednesday, according to NASA. It's an unusual event that shows the need for closer monitoring of near space for Earth-threatening encounters, a scientist with the program said. The objects don't pose a threat to Earth, and they will not be visible to the naked eye, said Donald Yeomans, manager of NASA’s Near Earth Program, which tracks potentially hazardous asteroids and comets within 28 million miles of Earth. The objects will visible from Earth as tiny specks of light with the help of moderate-sized amateur telescopes, he said. Near-Earth asteroid 2010 RX30, which is estimated to be 32 to 65 feet in size, will pass within 154,000 miles of Earth at 5:51 a.m. ET Wednesday. The second object, 2010 RF12, estimated to be 20 to 46 feet in size, will pass within 49,088 miles of Earth at 5:12 pm ET. In case you were wondering, that means the two asteroids will pass within 0.6 and 0.2 lunar distances from the Earth, respectively. The first will be closest to Earth over the north Pacific, and the second, over Antarctica. Roughly 50 million objects pass through near-Earth space each day, Yeomans said. But what makes this situation noteworthy is that these two asteroids are passing so close to Earth on the same day and that NASA spotted them so far in advance. "Things like this happen every day that we simply don’t know about because we don’t have the telescopes large enough to find them or surveys that are looking full-time," he said. "This demonstrates the system's working on some level, but we need larger telescopes and more of them to find objects that are coming this close." The Catalina Sky Survey near Tucson, Arizona, discovered both objects Sunday morning during a routine monitoring of the skies, NASA said. 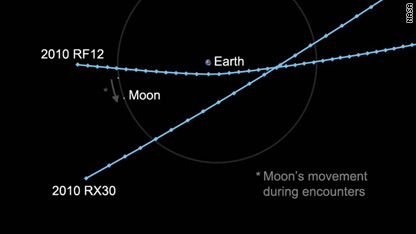 The Minor Planet Center in Cambridge, Massachusetts, first received the observations Sunday morning, determined preliminary orbits and concluded both objects would pass within the distance of the moon about three days later. Yeomans described the discovery as a warning shot in a field of study of low-probability events that have global, high-impact consequences. He said that it was only when scientists began looking for near-Earth objects in the 1990s that they realized there was a "problem." "We have only recently appreciated how many of these objects are in near Earth's space and [it's] best that we keep track of them and find them," he said. "I think this is Mother Nature's way of firing a shot over the bow and warning Earth-based astronomers that we have a lot of work to do." Is there an Ipad app that publishes real-time info on these observations? Would be good to know, maybe! More funding needs to go towards science...less for war and other unnecessary bs our government puts first. After all, science explains why we even exist in the first place. And if NASA was aware of some asteroid big enough to wipe out the earth, would you really want to know? I mean, c'mon all that's going to do is create world chaos. If it happens, I hope it comes in with a bang and wipes out mankind who, afterall, will be the cause of mankind's demise anyway. I think all this stuff is pretty cool. The universe has its own way of doing things and if earth is meant to be taken out, so be it. We have no control over it. In an earlier comment, I reported a typo in the article ("The objects will visible from Earth..."). I received an email from CNN congratulating me on finding the typo and telling me it had been corrected (tracking number 2793775-11413275). However, the typo has not been corrected. I might sound petty pointing this out, but that fact is I have reported at least twenty typos to CNN over the years and not one single one of them has been corrected, despite the fact that I have received emails telling me the typos have been corrected. Come on, CNN, show some journalistic integrity. I can understand that typos will occur, but the fact that you don't correct them even after they are reported in the comments section and in your grammar feedback form, indicates to me that you really don't care much about the quality of your reporting. If anyone finds typos in this comment, I'd be happy to correct them. This asteroids is part of space life and we are born from the asteroids. Asteroid seeded us and it gave us life and asteroids spread life in space and beyond. We the young children are growing up and learning how to walk and learn from our mistake while our father the alien watch us grow and learn how to walk in space and spread life in space. The Mars is our next step and we will learn how to survive and travel and techonolgy is our key word and techonolgy is magic. Some day we will have the technology to give life in space and plantets and we will do the same to explore and watch our children grow to learn how to walk and they will do the same. Just little bigger, may be couple of miles in diameter..
"The End", "Finito".. "Caput", "Son". Does any of your books, god(s), moses, crist, muhammed, budha, sheva, trees, mountains, etc, etc, etc..
tells you anything like WHAT SCIENCE JUST TOLD US...????!!!! Wednesday could well be the very end of ALL THIS JAZZ...!!!! You still want to burn the KORAN.. Burn it.. What will you gain..?? You are nobody but "JUST ANOTHER POPULARITY CONTESTANT.."
DON'Tt "DIRTY" YOUNG MINDS WITH YOUR USUAL HOKUS-POKUS.... PLEASE !!!! AS YOU HAVE BEEN DOING IN THE PAST THOUSANDS OF YEARS...! Take a break... AND SHOW SOME RESPECT TO SCIENCE, and OUR CHILDRENS FUTURE..!!! Okay, so Astronomers have a lot of work to do. Tell me...what would we do if we saw an Earth killer heading our way? This isn't the movies and Bruce Willis won't be flying a shuttle up to blast it to smithereens. All that would happen is that we would have advance notice of our demise. Assuming the Government decided to share that info. Do the horoscope for them and observe the chart- Just in case the Terrorists' are doing the charts still. And Remember, right or wrong, we attacked Afghanistan, on October 07th, 2001, 93 years after Austria's attempt in Oct 06th, 1908. Asteroids do weird things to us!